Monmarte is a hill to the north of the centre of Paris. It is the only hill on what is quite a flat landscape so is very prominent. On the top of the hill is a very impressive chuch called Sacre Cour. We arrived at Sacre Coeur and started wandering arond with a couple of hundred other tourists. We soon realized that there was a church service going on and we sat down to listen. The church service was quite interesting. It was of course in French so that made it more impressive. The nuns singing rang out across the church and it was quite an impressive display. The chuch itself is beautiful inside but unfortunately uyou are not permiitted to take photos inside. After the church service we noticed a sign for a crypt and dome tour and we thought we would give it a go. We started with the dome tour. There was no tour you simply went through a gate and started climbing a very narrow, dark and tight spiral staircase. I admit I had to choke back some claustrophobic feelings I climbed stair after stair in dark tight spiral. When we got to the top the views were magnificent. The top of the dome is pretty much as high, perhaps higher, than the Eiffel tower so you are the highest you can go in Paris. 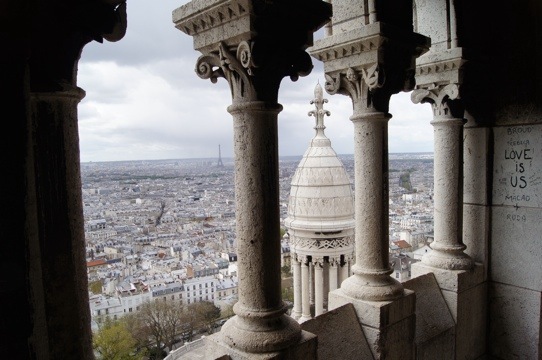 Also the view has the magnificent architecture of Sacre Coeur in the foreground. 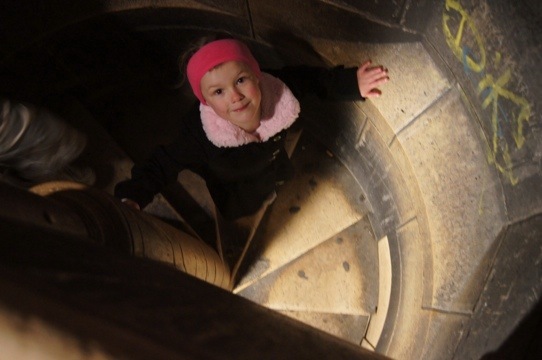 Having taken lots of photos we walked back down a different dark, low and tight spiral staircase. Somehow going down was much less claustrophobic. We then did the crypt tour. I was expecting the crypt tour to be full of graves and perhaps the odd skeleton hanging around. It was nothing like that t was simply the underneath part of the church where there was poor lighting, a number of rooms and a lot of statues. From the setup it seems that they use the crypts for kids scripture classes. Having finished our visit to the Sacre Coeur there was a little motorized train which had the name of a nearby station, Pigalle, written on the side. We thought we would appease the now tired kids by catching this motorized train down to the station. We hopped on the train and off it set. A few minutes later it I realized that this was not the quickest route to the station. A few minutes later on I realized that this was taking us on a tour of the streets around MonMarte but we would soon be arriving at the station. Another 10 minutes later we arrived back at our starting point. It seems that train was not a delivery service for tired tourists but a tour of the streets around Monmarte and Pigalle. I am glad we did it we saw lots of things we would not have otherwise seen. 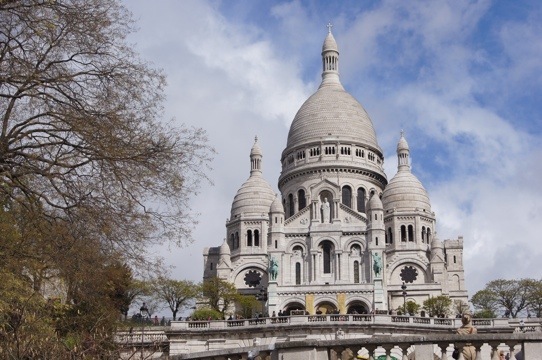 There is a funicular that takes you from Sacre Coeur down closer to the nearest station. We took the funicular down and then walked down another steep street to the metro station and headed for home. The kids were now sick of playing tourist and wanted to go back to the apartment and watch television.